Those of you who have followed my reviews here at Music Street Journal already know that I am a Rush fanatic. I have been following the band since the mid 70s and have been a fan ever since. I may not have been as rabid about some of their late 80s releases but I was nonetheless a fan and bought all of their releases. There have been relatively very few books written about this Canadian trio, especially given the fact that they have been releasing music for almost 40 years. Given all of this, it was a no-brainer for me with regard to ordering this book. This hardcover book was also written by someone who has vast knowledge in music. Martin Popoff seems to be the go-to guy when it comes to all things rock and metal. In fact, he has already written a book on Rush before: the authorized Contents under Pressure: 30 Years of Rush at Home and Away. That book followed the format of his other releases by making each chapter about one specific album. His vast knowledge of music and his access to the artists themselves gives his work much more detail and credibility. This new book follows a chronological order but does not read like the chapter/album fashion. This one is more about the photos and memorabilia than it is about the content. Now that is not meant as a bad thing. 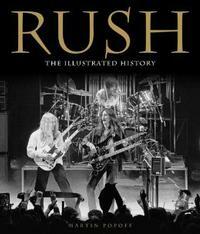 There is still plenty to read here but it doesn’t go into as much detail as his previous Rush book. In fact, I would recommend this as a companion book to the older one. This one is “an illustrated history” and reads more like the coffee table book that it is. Even though I have seen a few of the photos on offer here, the majority of the book is new to my eyes even though I have been collecting Rush items and photos for good part of three decades. Rush-The Illustrated History is a handsome book about a band that until recently were not getting the recognition they deserve. Martin Popoff should be commended for flying the Rush flag and scouring the earth for their pictures and their memorabilia. Oh, and by the way, if you would like a signed copy of this book by Popoff himself, just order it from his website www.martinpopoff.com.